We (Ashitda and his wife, Arko and his wife ) left for Pathra on 9.8.14. by Tata Sumo. Ashita picked us from Exide More and we took the road towards Kona Expressway. At Kolaghat Dhaba we had the usual rounds of tea (Rs 16), Kachori (4 pcs @ Rs 40). The food was good. Pathra, on the bank of the river Kangsabati, is a village of temples. There are 34 temples in the village, all over 200 years old. Barely 10-15 km from Midnapore town, this nondescript hamlet is a treasure trove for those who like to travel back in time. The history of Pathra goes back to the Gupta age, when the place was the hinterland of Tamralipta port, a gateway to southeast Asia. From 8th Century to 12th Century, it was an important hub for Hindus, Jains and Buddhists. A majestic Vishnu Lokeshwar statue dug out in the village in October 1961 revealed both Hindu and Buddhist influences, indicating that practitioners of both religions frequented Pathra. The turning point in the history of the village came in 1732, when Nawab Alivardi Khan appointed Bidyananda Ghoshal as the revenue collector of Ratnachawk pargana. Bidyananda established temple after temple in the village, making it a major draw for Hindu pilgrims. The nawab, however, was not too pleased with Bidyananda’s work. He was thrown into prison and then sentenced to death. Legend has it that the elephant that was to crush Bidyananda’s head refused to do so. The Ghoshal family changed its surname to Majumdar and continued building temples till the end of the 18th Century. 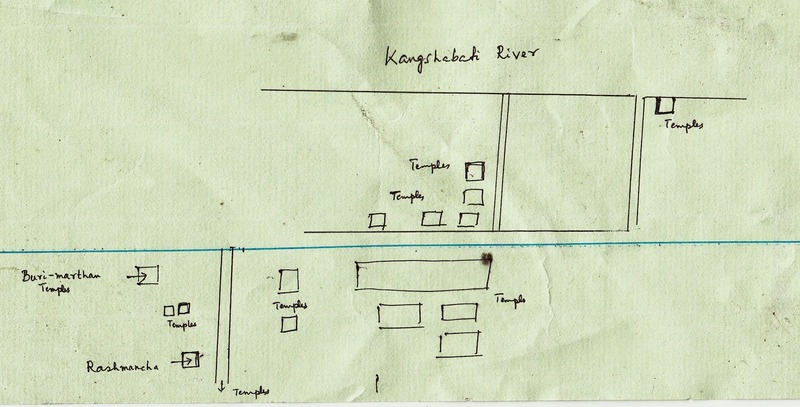 Another branch of the family, with surname Bandopadhyay, also started constructing temples. With indigo cultivation and silk trade boosting the family’s fortunes, funds were not difficult to come by. The decline started as the rich families shifted base from the village and ignorant local residents started vandalising the temples. Many of the structures were reduced to rubble. There was neither any initiative from the government nor from the academic circle to preserve the structures. The efforts of a local resident named Yeasin Pathan and a handful of scholars from the mid-1960s finally bore fruit in the form of government grant and technical assistance from IIT Kharagpur in saving the temples. A slice of Bengal’s glorious past was salvaged in the nick of time. The timid looking man with a frail frame would hardly resemble any activist. Md. Yeasin Pathan (awarded Kabir for communal Harmony by the Hon’ble president of India) was much beyond an activist. A Muslim who had struggled and fought for this upkeep of Hindu temples. A High School Peon who despite his meager means had given the temples the status they deserved. Over two centuries old these temples talked through the walls reminding us of the glorious days of the zamindars. Today, 28 out of 34 temples in Pathra are under the supervision of the Archaeological Survey of India. It has repaired 18 temples. There are two sets of temples - one on the road and near the river and second set of temples located about 200 m away and not at all visible from the road. These temples are far better preserved and well worth the little walk that will carry you there. When we reached we first encountered the nava-ratna temple (on the main road) on the western bank of the river is the grandest. The 250-year-old, 40-ft high structure has nine towers and many terracotta panels on its walls. A small aat-chala temple established in 1816 stands in the same compound. The backdrop of river makes it very interesting. We were told during rainy season the river takes a different shape altogether. Just opposite to it is a cluster of three aat-chala temples and a small nava-ratna temple called Shiva-laya. Terracotta artworks adorn these temples, too. Behind them is a Durga-dalan, a temple-like structure made of stone. There is also Kalachand dalan nearby. There is a small ground here where people often come for picnic and sometimes shooting takes places here. It is not very difficult for us to understand that the place is ideal for that - with terracotta temples all around.One of the temples show the date of completion 1761 – our guide Prabhash Bhattacharya showed us that. He is a very interesting person and even acted in a theatre and got award for his acting skill ! He made our day. Some distance away from the main road is another group of pancharatna temples, built in the typical Bengal style and enriched with terracotta sculptures.These temples are better preserved and have intact Shivalinga idols that are still worshipped by the locals.. The terracotta panels that still exist bear images of Ram, Balaram, Radha and Krishna, Dashavatar, Hanuman, Durga and hunting. One can see the guns in the hand of soldiers at the entrance.The majority of the temples are dedicated to Krishna, Vishnu and Shiva. Most of the temples offer glimpses of Islamic architectural styles. Stucco lime and seashell are the main materials used. There’s also a simple yet attractive rasmancha, built in 1832. It has nine small towers – little further ahead and then take left turn through the un-metalled road. There are few more temples on the way which we could not go because of heavy rain. The other important temples are Sarba Mangal, Das Mahavidya and Hansa. The second biggest temple of Pathra is a Sitala temple popularly known as Buri-marthan. It, too, is 40 ft high. The lousy restoration made to this temple with plasters look like any modern day temple. City planning students at IIT Kharagpur have done extensive research on Pathra. They have proposed to develop the village as a heritage tourism destination. We came back around 8 pm to Kolkata. We had also planned to go to Gopgarh, but had to abandon our plan due to rain. Local and express trains are running from Howrah to Midnapore. Distance from Midnapore to Pathra is 10-15 km. Pathra is easily accessible by car or trekker from Midnapore via Hatikhola. Pathra is a two-hour drive from the city. The road inside the village can be difficult to navigate after a spell of rain. Take NH6 (Bombay road) towards Kharagpur. Before reaching Pathra you will reach Kharagpur and then take the road which goes to the right towards Midnapore - soon after a few kilometers we crossed the bridge over the river kangsabati and asked for direction and then took an almost U turn from Dharma More . At the end (after travelling 7-10 Km to reach Pathra) there is a fork in the road one of which goes towards Midnapore and the other runs parallel to the river and goes towards Pathra - you fill find a giant banyan tree on the left. Keep following this road until you reach the temples which are well marked with ASI signboards. . But you have to ask people. People generally know the name Pathra. Pathan has written a book called “Mandir-moy Pathrar Itibritta”. On the way we saw a bridge which can be safely called Hunch back of Notredam ! Contact Pathra Archaeological Preservation Committee (Phone: 9932785126) for additional information. towards Medinipur – Single Lane road with occasional potholes. Towards Pathra – Road is under construction. Presently in very bad shape. Since there is no option for accommodation at Pathra therefore you have to stay in the town of Midnapore. WBTDC Rani Shiromani Tourist Lodge. Tel: (03222) 263125, 9732510074. Tariff - Double Bed Rs. 700-1000. The name of the book is"Mandirmoy Pathrar Itibritta" and not "Mandir Moy Pathra".